The Irish Gift House is a family owned and operated on-line gift store that specializes in Irish jewelry, Claddagh rings, Irish gifts and Celtic jewelry that includes Celtic Crosses and Celtic wedding bands. ﻿Jewelry of Dublin, Ireland. Acara is loosely translated from Gaelic and when used as a cara, it means friend. 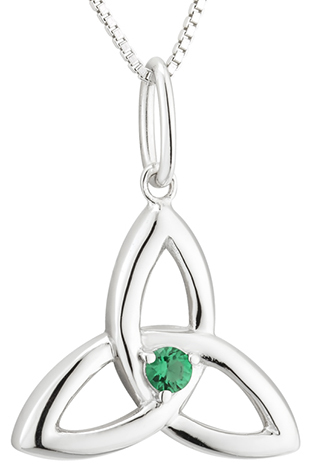 This new assortment of Irish and Celtic jewelry features Ireland's most popular icons that range from sterling silver Celtic cross necklaces to Trinity earrings along with shamrock earrings and Claddagh necklaces. Naturally, you will also find the Acara collection includes shamrock and silver Celtic necklaces along with Claddagh earrings. The necklaces may also be removed from their sterling silver box chains and then attached to your own charm bracelet. You will be able to browse the entire Acara collection on the new Irish gifts page on our site. Each piece is crafted in sterling silver and is hallmarked by the Irish Assay Office at Dublin Castle. 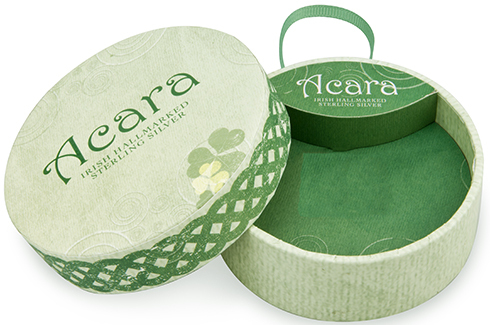 The Acara line is further enhanced with their own handsome green on green gift boxes that mimic miniature hat boxes with printed Celtic knot-work along with the ubiquitous shamrock. Each piece of this Irish made jewelry is delivered to you with the symbol's corresponding history card that is compliments of The Irish Gift House. This new line of Irish jewelry is moderately priced from only $26.00 to $36.00 per piece and these designs would be outstanding bridesmaids gifts. They would also be ideal gifts for Easter along with graduations. Because this is a rather extensive collection we will be introducing the line in batches and as we do each piece with be offered with a special introductory price. Hi, Sorry, but we only ship in the United States. keep it up. Awesome work.